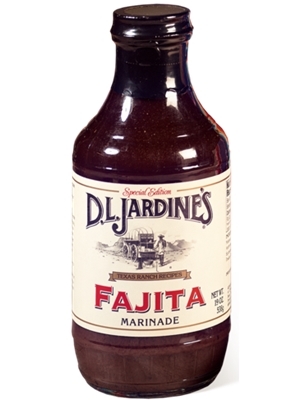 Authentic fajitas start with Jardine's Fajita Marinade, and we can say with Texas pride that ours simply has no equal. Makes outstanding beef or chicken fajitas from the grill, under the broiler or even pan fried. Also a good choice for marinating seafood and pork. 17.5oz. Worcestershire sauce (distilled vinegar, molasses, corn syrup, water, salt, caramel color, garlic powder, sugar, spices, tamarind, natural flavor), soy sauce (water, wheat soybeans, salt), water, cider vinegar, red wine vinegar, garlic powder, black pepper, lime juice and spices. *Contains Wheat and Soybeans. If the grocer would have this product in the store,I would buy more of this product. The best! My grocery store quit carrying it too - very upset.